Most individuals join Farm Bureau to network and connect with other farmers and agriculturists, develop speaking and political skills and participate in educational and social events. Many Farm Bureau members develop great friendships with other members. Some people even meet their best friends in Farm Bureau. This is the story about how with Farm Bureau and a little help from fate, you never know what may spark that initial interest. For me that spark came at the 2016 YFA Conference. During the course of conversation at the Saturday evening dinner, I had made a joke. What the joke was we don’t remember, but what we do remember is Lynn laughed right away and no one else found it funny. For me that was the moment that sparked an interest into finding out more about this girl that thought I was funny. That wasn’t the first time that we had met. Lynn and I were each of our respective counties’ YFA chairs and we had competed against each other in the YFA Discussion Meet in 2015. Lynn’s moment of intrigue occured a couple years prior, but that’s a story best told by her. Fast forward a month. We are in the midst of the high capacity well bill debate. I have always been interested in policy and politics and was just about to begin the second year of my term on the Wisconsin Farm Bureau Policy Development Committee. So where could I go to get first hand knowledge of the impact and effects of this new legislation? To the super smart, pretty girl from Waushara County that thought I was funny of course! Her work as a research agronomist for a potato farm was sure to mean she could share some valuable insight. We discussed the bill and the importance of high capacity wells to the central sands region. Over the next couple of months our conversations would cover other topics besides water issues. Basically, it works like this: Lombardi expected his players and coaches to be 15 minutes early to meetings and practices. Not on time — 15 minutes early. If they weren’t, he considered them “late.” Thus, it came to be called Lombardi time. The morning of the policy development meeting, this past March, I was running late! Call it poor time management, happenstance or fate. Arriving to the state Farm Bureau office in Madison just as the meeting was supposed to start, I rushed on to the elevator just as the doors were closing. The button for the Farm Bureau offices floor was already lit. I surveyed the elevator. To my surprise the companion for my short ride was none other than Lynn! We ended up sitting next to each other at the meeting and our lunch conversation flowed effortlessly. This wasn’t the end of our Farm Bureau fueled rendezvous. 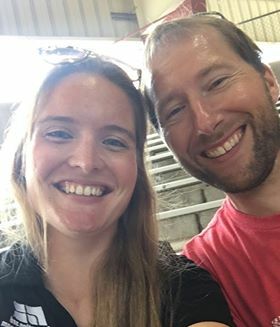 The following weekend, we both attended Marquette County wine and cheese tasting. The weekend after that we attended my county’s YFA spring meeting and farm tour. Sandwiched in between was our first official date. Many dates followed. Quite a few coincided with Farm Bureau activities and six months after our first date we were engaged! We are now happily married and settling into our first home together. I’m still passionate about agriculture, policy and politics and being an active member of my county Farm Bureau and I’m excited that my wife shares similar interests. Lynn and I aren’t alone in meeting each other through Farm Bureau, as I know other couples who have also met during county, district or state activities. Now I’m not here to tell you that joining Farm Bureau will lead you to your soul mate, but this story was just too fun not to share. Mike Leahy is a member of the Fond du Lac County Farm Bureau Board of Directors and serves as chair of the investment committee. Spending nearly all of his life as a dairy farmer a career change finds him as an Irrigation Technician for Heartland Farms. Mike and his wife Lynn currently reside in Plover with their two cats Chance and Peaches.